Keep your family's name or memorable location forever written in the sand with this personalized art. For each print, Patricia Carlin illustrates the details that define your coast-craving tribe: hair styles and colors, skin tones, outfits, and props--bring along a book, watermelon, and beloved pet if you like. The piece is mounted in your choice of either a driftwood-inspired or solid black frame. 2-14 figures. Illustrated in Pennsylvania. Printed and framed in Oregon. Received this as a gift? Follow the instructions in this PDF to customize your family art. View the full menu of character and color options. Perfect Gift for the Grandparents who live near the beach! After a disappointing first try, we received a corrected piece that is absolutely correct. Our family name was misspelled after I was assured that the error would be corrected on the proof. Having no choice, I gifted the artwork, contacted UC and the problem was remedied with a replacement very quickly. Now, all thirteen of us not only look great - we are correctly named! After ordering numerous gifts, several of which were personalized beyond the normal request, I am very happy with the product, the process, and the outstanding customer service. The picture came out perfectly!! It was perfect! My parents were so excited to see the family. Everyone's likeness was spot on and names were spelled correctly. 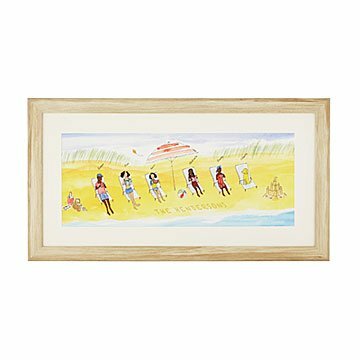 The frame was beautiful and looks great in their beach-themed home. I can't wait to give this gift to my husband, plus I think the whole family will love the memories it will evoke. We always have such great beach trips, & this wall art captures them forever. They were so quick to get me my proof and shipping was fast! I absolutely love how personal the painting is. This made the best gift! I love my family beach picture. I plan to hang it in my beach condo. With all the options for descriptions, we pretty much described each person as they really are. I think this will be a great conversation piece. Perfect gift for a special family! this is a wonderful gift for folks that are difficult to buy for....i bought two and both families were absolutely thrilled. the children loved being part of the art work. Such a great gift. Everyone enjoyed this.